Colin Joyce is equally at home painting in his studio as he is in the open air, and happily works in watercolour, acrylic, oils, or pen and wash. Originally from Sunderland, Colin is now based in Dunfermline where he has a bright, modern studio built to his requirements. That said you are quite likely to find him out and about in the Scottish countryside either painting on location or with his camera recording scenes for possible use in the studio. It’s not just the Scottish landscape that attracts him. 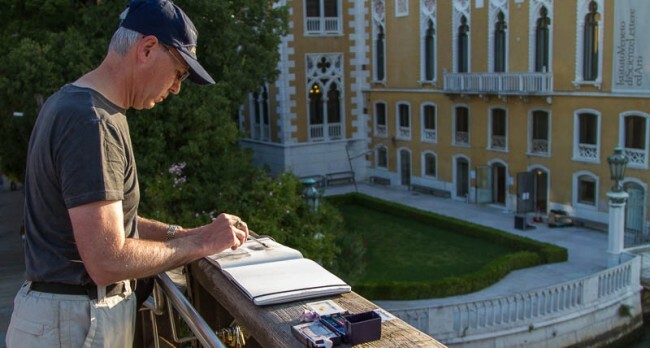 Colin visits many parts of the U.K., as well as Europe, and especially Venice which he particularly loves. He has also visited Morocco and is a regular visitor to Texas. Look out for work from even further afield in the coming months. Art has been an interest since his teenage years, along with photography which helps tremendously in understanding composition. As is the case for many people, life and a ‘real’ job gets in the way of doing the thing you love. It was not until the year 2000 that Colin set about following art with a view to making it his second career. He has now been painting full time for over two years. It is one thing to be able to paint, it’s another to build up an extensive knowledge of the properties of paints from several different brands, and how the colours from those manufacturers behave. And it’s not just paints. Ask Colin about different watercolour papers or canvases, or brushes, or about types of palette, or paint boxes, and you’ll get surprisingly detailed and practical advice. He has recently designed and made his own boxes to carry several small oil boards at once without them smudging or sticking to each other. Colin also has a remarkable knowledge of the work of different artists and frequently collects paintings that inspire him. Exactly which medium is used and where is to a large extent governed by the climate and the time of year, at least as far as outdoor painting goes. Warmer climates tend to be good for both oil painting and watercolour. When winter comes or if the climate is damp then painting in watercolour is not such a good idea as it takes too long to dry between washes. When the weather is so bad that you are walking around in waterproofs for much of the time then simple sketches or photographs for use back in a warm dry studio are much more practical. A member of Dunfermline Art Club, he not only joins in their activities but also teaches classes there. He also gives workshops and demonstrations for art clubs throughout the U.K. 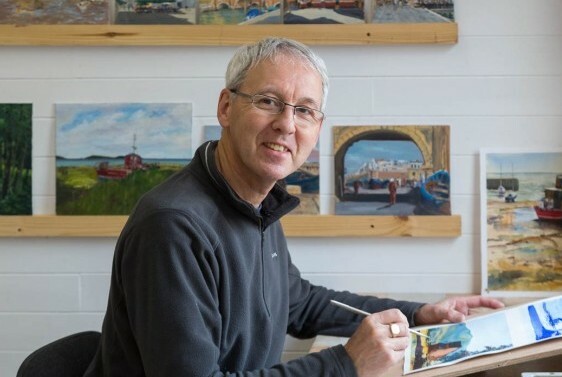 If you would like to find out more about Colin’s work visit his website at https://colinjoyceart.com where you can also subscribe to his art newsletter. If you live near Fredericksburg, Texas, you will find some of his watercolours on display and for sale as part of an exhibition at the RS Hanna Gallery. Thanks for the great write-up Dave, much appreciated.